The sophomores of the Class of 1875, with assistance from a few members of other University classes, were responsible for founding of the College Boat Club in October of 1872. 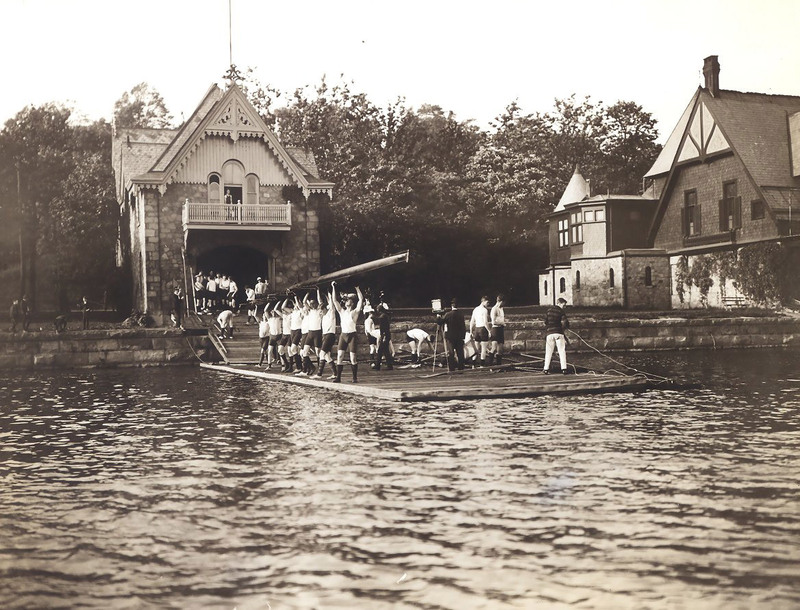 The College Boat Club was also known in its earliest years as the College Barge Club. Thus, William R. Philler’s copy of the first 1872 constitution of the College Boat Club is entitled “Constitution of the College Barge Club of the University of Pennsylvania, organized October 7th” (the date is crossed out and “Sept. 30th, 1872” is written in pencil above). This College rowing club did not initiate the sport at the University of Pennsylvania; that honor goes to the University Barge Club, founded two decades earlier in 1854, and to the class crews from the 1850s through the early 1870s. The College Boat Club, however, was responsible for the development of intercollegiate rowing at Penn. In 1871, Amherst, Brown, Bowdoin and Harvard had formed the Rowing Association of American Colleges, and Penn rowers were eager to join the ranks of intercollegiate rowing. The College Boat Club’s charter members were seriously interested in competitive rowing and in putting together an all-University crew to compete at the intercollegiate level. The Executive Committee consisted of Gowen, Megargee, and Samuel T. Kerr. All except vice-president William H. Patterson, A.B. 1876, were members of the Class of 1875. In this first year, there were seventeen other active members along with three honorary members and one contributing member. The bulk of the club, fourteen young men, were sophomores from the Class of 1875. As for the rest, three were freshmen, three were juniors, one was in the Medical School, and one would be a freshman in the coming year. The status of only two members can not be accounted for. From the beginning, the College Boat Club had a close connection with class crews. Calhoun Megargee had been captain of the Class of 1875 crew in his freshman and sophomore years. Frank Eyre, Bernard Gilpin, Lindley Johnson, Sterling Morrison, William R. Philler, and Carroll Smyth were also both members of the Sophomore Crew and charter members of the College Boat Club. The College Boat Club quickly established its presence in University life. By 1874, the College Boat Club had amassed the resources to build their boathouse on Boathouse Row on the banks of the Schuylkill. The 1874 yearbook listed the newly founded Athletic Association and the College “Barge” Club (as the College Boat Club was sometimes referred to in its early years), along with the University Barge Club and class crews for the Classes of 1874 and 1875. The College Boat Club was formally incorporated in 1875. The College Boat Club served as the home of Penn varsity rowing until men’s crew became an N.C.A.A. sport in the middle part of the twentieth century, At that point, the Women’s Crew, then a club sport, took on the name of the College Boat Club of the University of Pennsylvania. Club members were eager to row intercollegiately. Their first steps toward that goal were to put together an all-university team and provide rowers with experience in competitive racing. In 1877, the all-sophomore crew from the College Boat Club defeated a University Barge Club crew, made up of four Penn seniors, in a race between four-oared shells on a mile and a half straight-away course on the Schuylkill River. In the following year, 1878, College Boat Club crews participated in three regattas: the Schuylkill Navy regattas on June 8 and June 14 as well as the Nautilus Boat Club regatta in Reading. However, none of these competitions were with crews from other colleges. After these early forays into competitive rowing, the College Boat Club entered the intercollegiate arena, up to now dominated by Harvard and Yale. 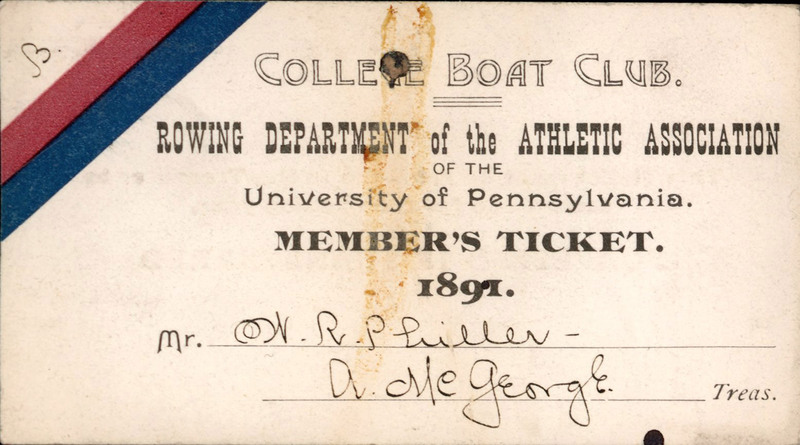 1879 was a crucial year for the College Boat Club and for rowing at Penn. This was the year of Penn’s first participation in intercollegiate rowing competitions and also of Ellis Ward‘s arrival on the scene as trainer and coach. From this point on both class crews and varsity crews would be based in the College Boat Club boathouse. As the century progressed, changes would come as intercollegiate rowing matured. At first four-oared boats predominated, with some use of six-oared craft, but later eight-oared boats would be popular. The College Boat Club would continue to be the base for the training of both varsity and class crews. Coach Ward, and briefly Coach Woodruff, were particularly interested in the coaching of freshmen as the basis for future class crews and for the varsity crews. This rowing organization, like the University Barge Club before it, also came to include both Penn alumni and students. After the founding members of the College Boat Club graduated from the College and the Law and Medical Schools, they remained in the College Boat Club. The emphasis at the College Boat Club remained, however, competitive rowing. The 1875 yearbook listed crews for the classes of 1875 and 1877 as well as the College Boat Club, which now boasted 34 members. Calhoun Megargee was stroke of the senior crew and still president of the College Boat Club; he continued as president in 1879, even after his 1878 graduation from Penn’s Medical School. After his death, William R. Philler, another of the founders, took over as president of the club. There was only a brief period when membership was open to all students so long as they were of “good character” and could pay the dues. For most of the Club’s history membership has been limited, with some variations, to past and present members of Penn varsity crews. Beginning in 1888, only members of both freshmen and varsity crews were eligible for membership; and in 1897, membership was restricted to members of the varsity eight oar crews, plus the coxswain and manager. In 1904 the varsity four-oar crews as far back as 1899 were admitted. Today membership is limited to former Penn varsity rowers. The membership issue is related to the Club’s most essential need in its early years: establishing sources of financial support. Because the University did not yet provide funding for any sports, the students had to find their own sources of funding and had to be creative in obtaining boathouse space and boats to row. The solitation of subscriptions (donations) and the staging of fundraising activities were ongoing. For the first two years, members of the College Boat Club were permitted to use the boat house of the Quaker City Club while the College Boat Club worked to raise funds to build a boat house on the Schuylkill River in Fairmount Park. The College Boat Club boat house was completed in 1874 thanks to funds raised by private subscription. In the fall of 1873, the Club gained some financial support by its incorporation into the newly formed Athletic Association of the University of Pennsylvania. 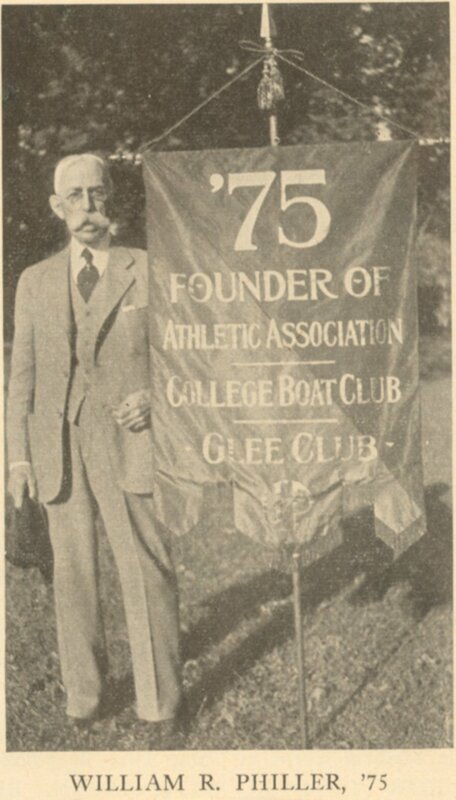 However, because the Athletic Association devoted more attention and funding to more major sports, the College Boat Club still needed to look for alternative sources of support and to limit their expenses as much as possible. They even had to use second-hand boats in their early competitions with other clubs in the “Schuylkill Navy,” the term used to refer to the clubs along the Schuylkill River just upstream from the Philadelphia Waterworks. Financial resources remained an issue even after the alumni, in 1882, stepped in to help finance and direct Penn’s competitive sports teams by incorporating the Athletic Association of the University of Pennsylvania. The College Boat Club and the Athletic Association each provided members for the Committee on Rowing which oversaw Penn’s intercollegiate rowing crews. The Pennsylvanian of January 15, 1891, describes the combined effort of the Athletic Association and the College Boat Club to raise money for rowing through the performance of the comic opera “The Doctor of Alcantara.” On May 28th of that year The Pennsylvanian reported the arrival of a new eight-oared shell at the College Boat Club; coach Ward was supplying the oars as well as patent safety locks of his own invention. In 1893, the College Boat Club, or the Rowing Club, passed resolutions allowing both alumni and general University students to become members in return for the payment of dues. The president, however, had to be a University student; he was to be one of five members of the Athletic Association’s Rowing Committee. This spring they had a new float and slip and refurbished boat house and were discussing the purchase of a boat launch.